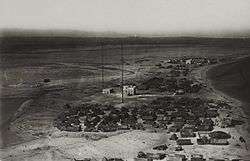 Aerial view of Aluula in the 1920s. 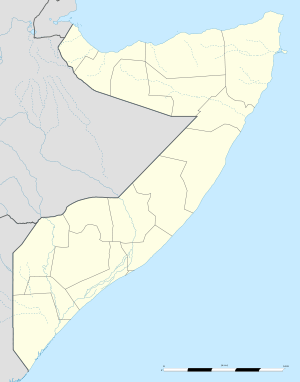 Alula (Somali: Caluula, Arabic: علولة‎‎), also spelled Aluula, is a coastal town in the northeastern Bari province of Somalia. In the late 19th and early 20th centuries, it served as the main capital of the Majeerteen Sultanate. Alula is derived from the Somali term "lul", which means pearl. Alula is located about 50 kilometres (31 mi) west of Cape Guardafui, at the extremity of the Horn of Africa. 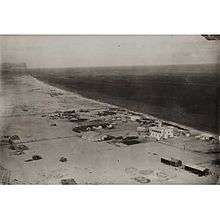 20 nautical miles (23 miles) east of Alula lies the coastal town of Bereeda. 7 nautical miles (8 miles) west lies Ras Filuk, the likely Cape Elephant (Elephas) of Strabo and the Periplus of the Erythraean Sea. Adjacent to Alula is a shallow lagoon surrounded by mangrove bushes, which appears to correspond with the "large laurel-grove called Acannae" also described by the Periplus. An area in Aluula circa 1925-1927. On the coastal plain 20 km to Alula's east are ruins of an ancient monument in a platform style. The structure is formed by a rectangular drystone wall that is low in height; the space in between is filled with rubble and manually covered with small stones. Relatively large standing stones (menhirs) are also positioned on the edifice's corners. Near the platform are graves, which are outlined in stones. 24 m by 17 m in dimension, the structure is the largest of a string of ancient platform and enclosed platform monuments exclusive to far northeastern Somalia. During the mid-1800s to early 1900s, Alula served as the main capital of the Majeerteen Sultanate (Migiurtinia). A castle built in the city for the kingdom's Boqor (King) Osman Mahamuud is one of a number of local remains from this era. In the post-independence period, Alula became the principal town in the Alula District, situated in the autonomous Puntland state. On April 8, 2013, the Puntland government announced the creation of a new region coextensive with Cape Guardafui named Gardafu. Carved out of Bari, it consists of three districts and has its capital at Alula. The new region was officially approved by legislators on July 20, 2013, during the 30th session of the Puntland parliament. Alula has a number of academic institutions. According to the Puntland Ministry of Education, there are 11 primary schools in the Alula District. Among these are Xabo, Geesaley, Murcanyo, Xoogad and Alula Primary. Air transportation in Alula is served by the Alula Airport. According to the Somali government, the town has a small seaport. 1 2 Chittick, Neville (1975). An Archaeological Reconnaissance of the Horn: The British-Somali Expedition. pp. 117–133. ↑ Hess, Robert L. (1966). Italian colonialism in Somalia. University of Chicago Press. p. 127. ↑ "Somalia: Puntland Parliament approves new region and cabinet members". Garowe Online. 21 July 2013. Retrieved 28 July 2013. ↑ "Puntland - Primary schools". Ministry of Education of Puntland. Retrieved 26 May 2013. ↑ "Alula (ALU) Somalia". World Airport Codes. Retrieved 28 July 2013. ↑ "Klimatafel von Alula / Somalia" (PDF). Baseline climate means (1961-1990) from stations all over the world (in German). Deutscher Wetterdienst. Retrieved 22 October 2016. Wikimedia Commons has media related to Aluula.